Diamond Jack is a meat and potatoes man. A real Nevadan. 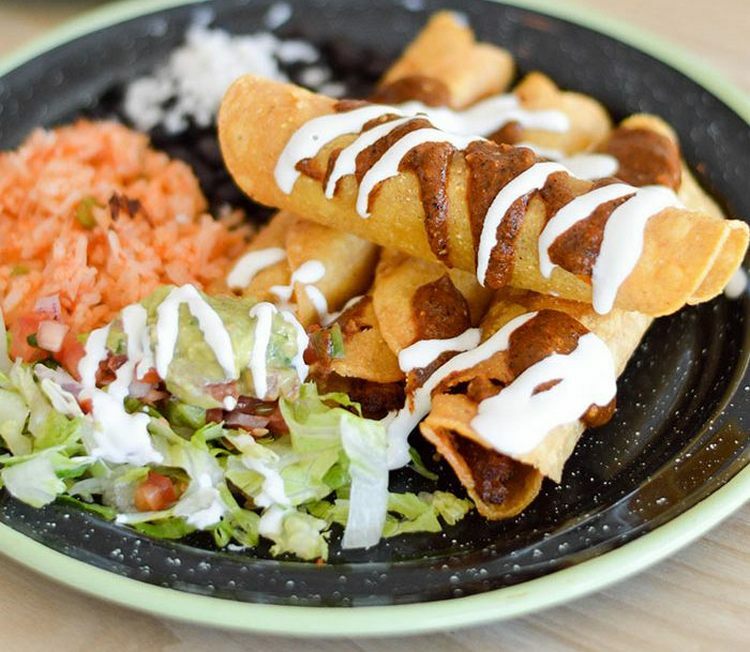 However, he knows that plant-based foods are finding a greater audience than ever before, and he has discovered Tacotarian, a 100% plant-based Mexican restaurant. Street tacos take center stage in the 40-seat restaurant with a dozen different variations, including Carne Asada made with wheat-based seitan, Barbacoa using mushrooms, Dorado with mashed potatoes, and Baja using battered avocado. You can also enjoy Frito Pie, house-made guacamole, burritos, nachos, and quesadillas. Featured desserts include Churros with dairy-free vanilla ice cream. Enjoy wine, seasonal margaritas and Tacotarian plant-based beer. Tacotarian, 6135 So. Fort Apache Road, is open daily 11 a.m. – 10 p.m. www.tacotarianlv.com. 702-979-9329. There’s a new game in town: Casino Dominoes. It’s live on the casino floor at the historic Plaza Hotel and is similar to three-card poker or blackjack. Inspired by the classic game of dominoes, it utilizes up to six players at once. Players are dealt three cards and one connector card each. The goal is to match their domino cards to the connector card using standard domino rules. Scoring is calculated in multiples of five. The more points collected, the higher the payout. Players can win up to 500 to 1 on a wager, with the option of placing doubles side bets. Casino Dominoes “Learn to Play” classes are free and held daily at 5 p.m.
You’ve spent a lot of money on presents for the holidays. Isn’t there something free or almost free (as in really cheap) to do in Las Vegas in December? Well, yes Virginia … there is! The famous Bellagio Fountains are a free must-see when visiting Las Vegas. 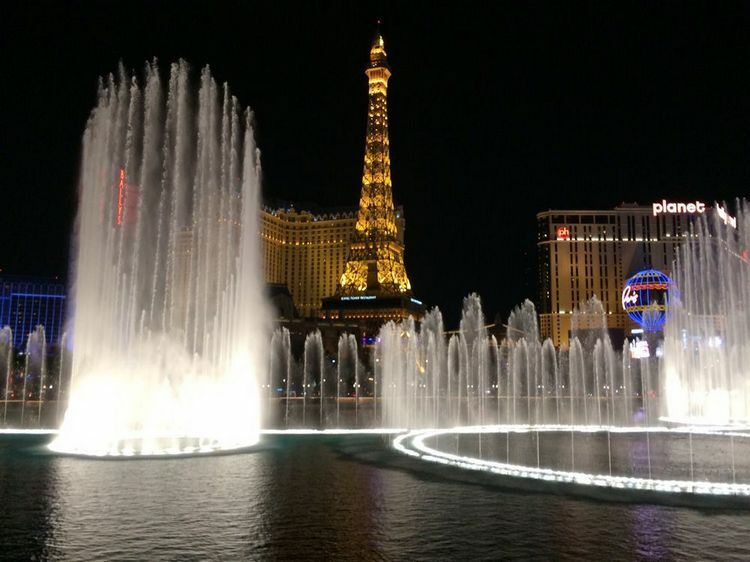 Each show features the dancing waters perfectly synchronized with different genres of music and is a relaxing, peaceful way to spend a few minutes each day. You can enjoy Elvis’ Viva Las Vegas, Celine’s My Heart Will Go On (Titanic), Bruno Mars Uptown Funk, Michael Jackson’s Billie Jean, along with Con Te Partiro (Time To Say Goodbye) from Andrea Bocelli. While the outdoor shows run for only 3-5 minutes you can see them every 15-30 minutes every day of the week at different times of the week, unless the weather, as in wind, forces them to be cancelled. Catch shows during the daytime and nighttime to truly experience the water, lights and music. Monday through Friday the shows begin at 3 p.m. running every 30 minutes until 8 p.m. when they change to every 15 minutes until midnight. On Saturdays and holidays, the shows begin at noon, running every 30 minutes until 8 p.m., changing to every 15 minutes from 8 p.m. until midnight. Sundays, the 30 minute shows begin an hour earlier at 11 a.m. until 7 p.m. and every 15 minutes from 7 p.m. until midnight. 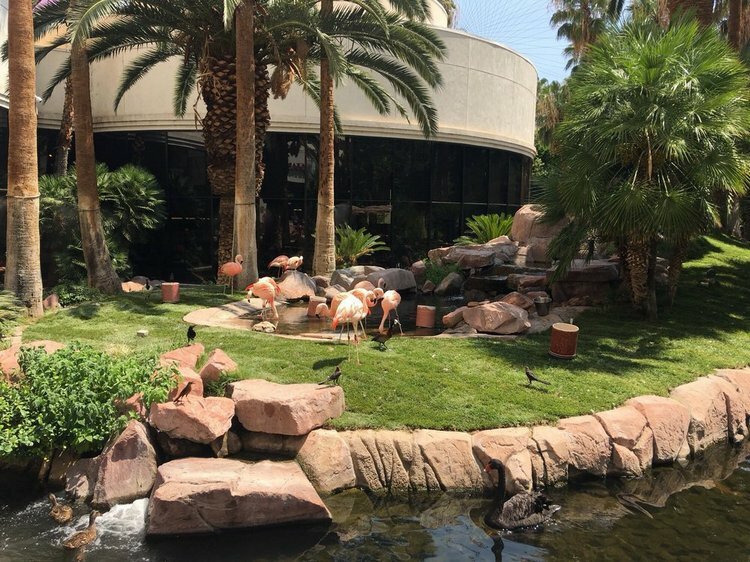 Another freebie that most people don’t think about is the Flamingo’s Wildlife Habitat. While this might not be a drop-everything-to-see-it trip for you to make, it is worth passing through if you are in the area and either staying at the hotel or already parked in the area and need a little distraction from the gambling, shopping and craziness of Vegas. There are ducks, fish, birds, flamingos (natch), and swans, including a black swan which is absolutely beautiful, and other exotic wildlife to view up close in a lush setting. Ethel M Botanical Cactus Garden and attached chocolate factory are a short trip east of the Strip and always a winner during the holidays, with free entry. At night, the garden is overflowing with beautiful holiday lighting and music. 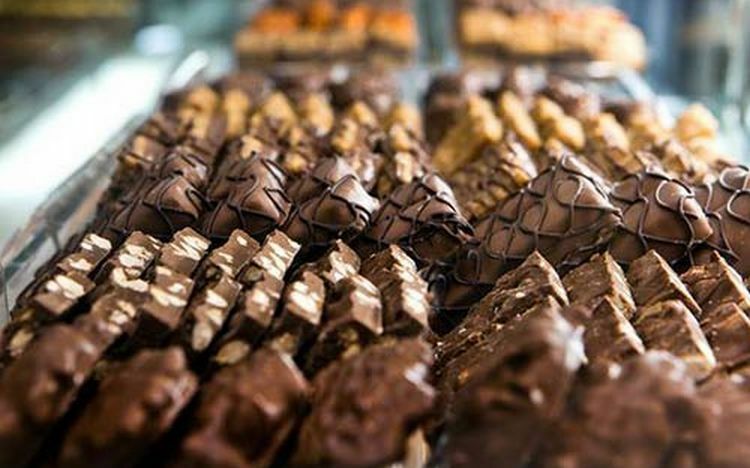 You can take a free, short, self-guided chocolate tour showing you the chocolate candy making process, but beware of the end of the tour where your mouth will be watering for those chocolates which are available for purchase but not for free! In case you were wondering, they also have a chocolate sampling experience for $15 per person, where you are able to sample 4 chocolates and receive a 20% coupon off anything you purchase in their store. You can add the wine tasting for an additional $10 per person. 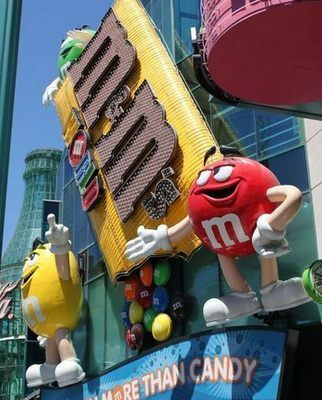 Now that you have started your indulgence in chocolates, it’s time to visit the Strip for both Hershey’s Chocolate World at New York/New York and M&M’s World across the street, right by the big Coca Cola bottle, to the north of MGM. Both locations have free entry, although I am not sure how you will get out of either of them without spending some of your cash! This is a nice time to buy chocolates since it is not 110 degrees outside, so your chocolates should stay intact. Just make sure you watch your prices! Hershey’s opens at 9 a.m. every day and stays open until midnight Sundays through Thursdays and until 1 a.m. on Fridays and Saturdays. It is 2-stories inside of New York/New York Hotel & Casino. You can purchase pastries, cookies and candy in packages, or you can customize your Kisses flavors and Reese’s. Don’t forget your samples! They have a candy Statue of Liberty on both floors. Upstairs is the Twizzler’s version, with the chocolate version on the 1st floor. They sell everything with the Hershey’s brand, including Jolly Rancher candles. (Yes, I said candles!) They also have a “chocolate bar” outside of the store. Chocolate martini, anyone? Now, run across the street to M&M’s World (not literally … take the bridge across from New York/New York). 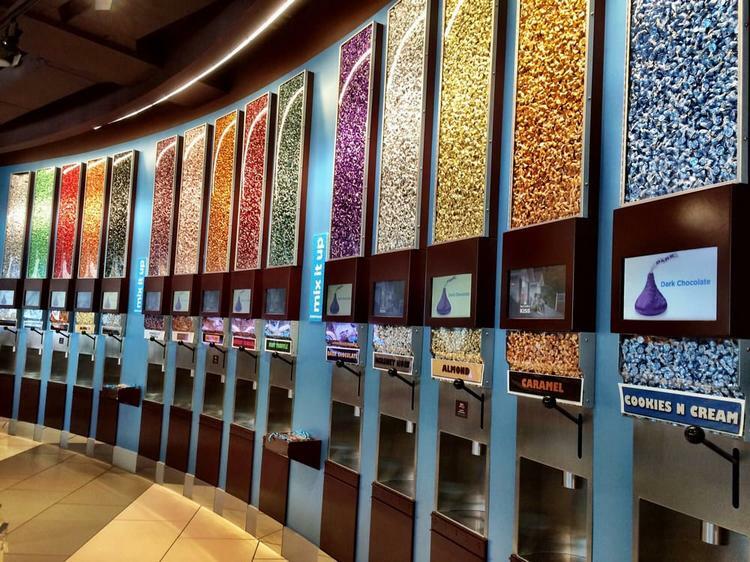 M&M’s World is a different experience from Hershey’s. They are open 7 days a week from 9 a.m. until midnight. They have 4 floors of goodies, along with a free 4-D theater for children (and adults, of course). The show is on the 3rd floor and lasts about 10 minutes, and it is cute. Also on the 3rd floor, you can personalize your M&M’s if you want to create a message on each M. The 4th floor has the replica M&M’s NASCAR No. 18 car. The 2nd floor has the mix and match colors and the limited-time, flavored M’s, like pecan pie and butterscotch with white chocolate, honey nut, coffee nut, and chili nut. Again, a word on prices: a half pound of pick your own is $8.99. That is a half pound, not a full pound! And in the what-were-they-thinking category, they even sell Ethel M chocolates! They also give out free samples and have discounted items, since they sell all kinds of merchandise with their logo. And check out the blankets that smell like chocolate! 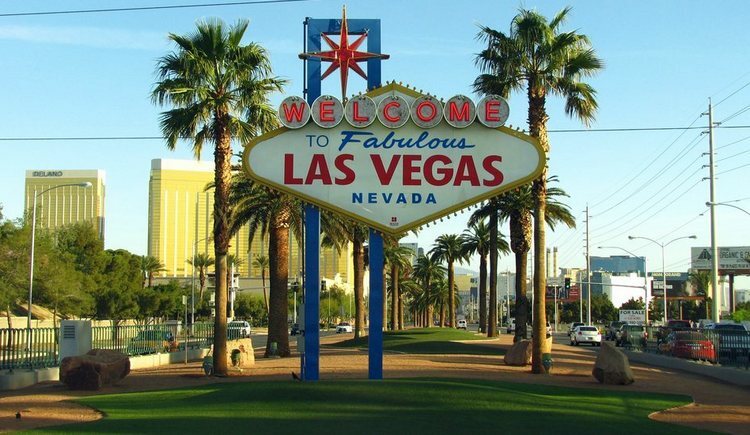 The Welcome to Fabulous Las Vegas Nevada sign is a definite freebie, if you have the transportation to get to it. It is located in the median of the south part of the Strip across from Mandalay Bay. It is an easy access if you have your own vehicle or rental car, since there is free parking by the sign. Parking is limited (a dozen spots), so get there early if you are going this route. And drive through this area slowly because it is 1 way in using the left hand lane on the Strip for parking. Hint: you will actually see the back of the sign stating Drive Carefully Come Back Soon just before your turn into the parking lot. The stop light is after your turn off for pedestrians to cross the Strip. If you miss it you will have to circle around on Las Vegas Boulevard to get back. There is also an RTC bus stop across the street from the sign. You can pick up the bus almost every block on the Strip in front of the hotels. There is a charge for taking the bus. For example, from New York/New York Hotel it will cost $6 for the 9 minute trip. Just food for thought: if you walked from this hotel it would take 30 minutes and cost nothing! So if you are already staying at Mandalay Bay it is definitely doable. The Deuce bus route on the Strip is $6 for a 2-hour pass and $8 for a 24-hour pass. This is probably the best time to go. You will not be standing out in the heat of summer, waiting in line to get in front of the sign without other tourists blocking your photo. People are normally very friendly and the line moves quickly. Of course, you can always take a photo with other people in front of the sign, but what would be the point? There are usually photographers at the site to take your photo if you have no one else to do it for you. You might even see a showgirl or an Elvis impersonator! The Stratosphere has opened a new 24-hour restaurant on the main casino floor. Strat Café & Wok is 4,485 square feet and serves traditional Asian cuisine. The venue’s design is modern and colorful with an urban vibe inspired by the neighboring Downtown Las Vegas Arts District with bold art pieces by local artists adorning the walls. The menu highlights an array of breakfast, lunch, dinner and late-night offerings. 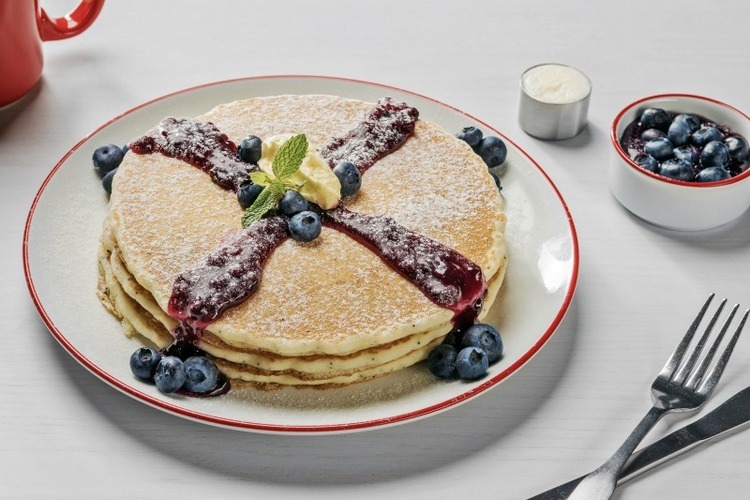 Breakfast selections start at $9, variety of soups, salads, starters, sandwiches and burgers at $8, and entrées at $14. Hours are 11 a.m. to midnight. There’s another new dining option at the Galleria at Sunset mall with Rodizio Grill opening last week. The authentic Brazilian restaurant is outside of the retail destination facing Sunset Road. 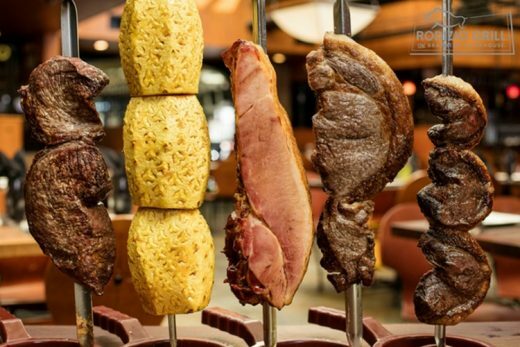 Established in 1995, Rodizio Grill was the first Brazilian “churrasco” steakhouse in the United States. More than 20 years later, the brand is known for its playful Brazilian spirit featuring rotisserie-grilled meat carved tableside by traditionally dressed Gauchos. While the main attraction are the meats, they are complemented with a gourmet salad bar and hot side dishes. With family being important in the Brazilian culture, Rodizio Grill offers discounted pricing for children, special promotions for family celebrations, and an email club providing special offers. 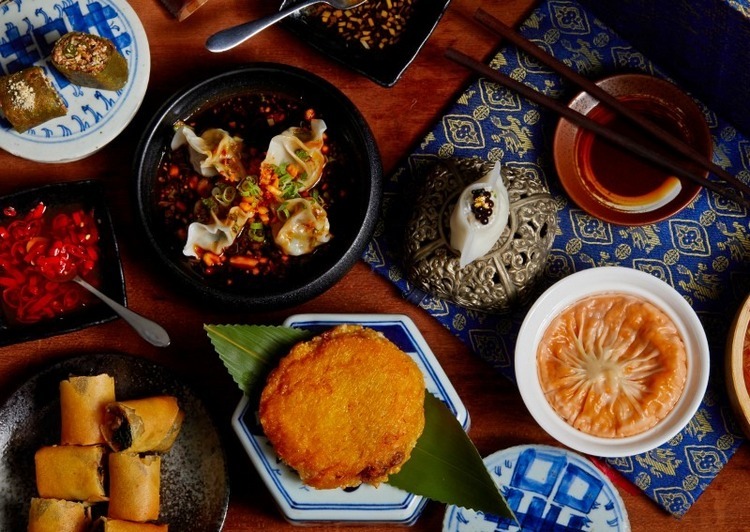 In December Mott 32 will debut its first restaurant in the United States when it opens on the casino floor at The Palazzo celebrating Hong Kong’s culture and culinary traditions. Renowned award-winning interior designer Joyce Wang’s different design pays tribute to Las Vegas’ history by showcasing dining tables made from vintage roulette wheels, a chandelier adorned with a feather boa, neon signs, and more. Mott 32’s farm-to-table cooking style is led by Group Executive Chef Man-Sing Lee, a two-Michelin star chef in his previous role, and Vegas-based Head Chef Alan Ji. The culinary team will showcase the Cantonese, Szechuan, and Beijing cultures and highlight signature dishes such as applewood roasted Peking Duck. 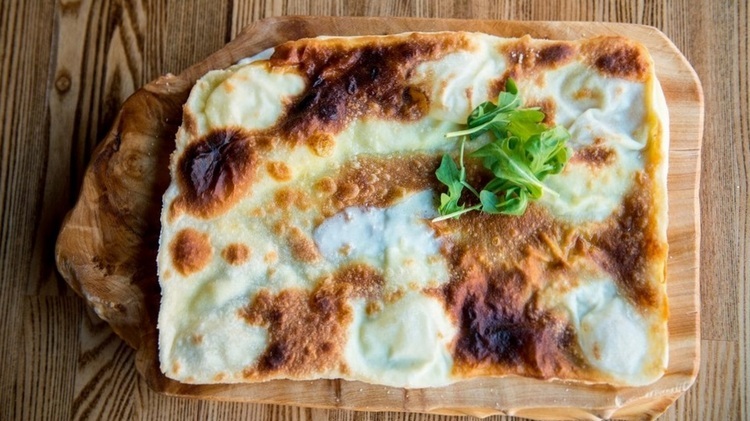 From the Factory Kitchen, Focaccina Tradizionale – Crescenza cheese, wild baby arugala and olive oil. The Factory Kitchen, an authentic Italian restaurant from Los Angeles, will premier at The Venetian on Dec. 28 and be open for lunch and dinner. Matteo Ferdinandi, CEO of FactoryPlaceHospitalityGroup, and longtime friend and partner Chef Angelo Auriana, will be presenting traditional recipes from their Italian upbringing, which they brought to America. The approachable menu highlights the simplicity of traditional local recipes and uses fresh, seasonal and locally sourced ingredients. Italian restaurant Cipriani Las Vegas opened this month in Wynn Plaza Shops at Wynn providing a true taste of Venice with Cipriani’s Bellini, created in 1948 by Giuseppe Cipriani Sr. at the original location, Harry’s Bar. This is the brand’s first West Coast location. Known for classic glamour, Florentine architect Michele Bonan designed the restaurant featuring a nautical feel, glossy walnut and chrome accents and terrazzo floors. 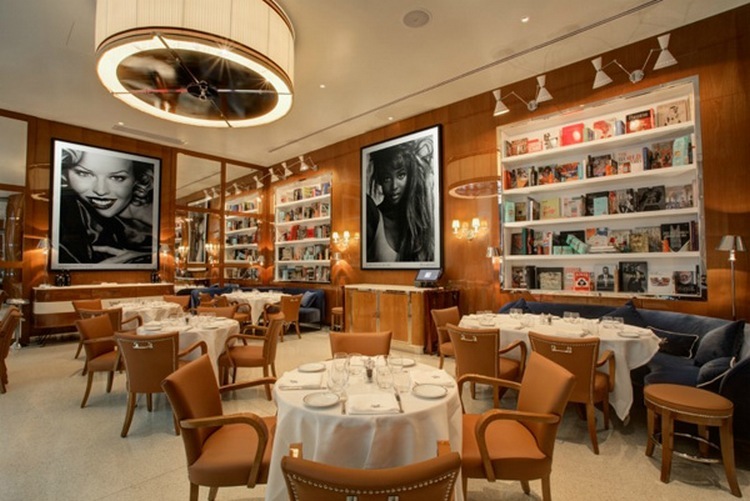 On the walls are photographs of models including Cindy Crawford, Claudia Schiffer and Naomi Campbell shot by Marco Glaviano. The restaurant has a separate private dining area perfect for intimate affairs.